Regular Not Delia readers will know that Mr Not Delia and I enjoy hotel buffets. As well as the opportunity to try lots of different foods, they’re also great for giving a keen cook new ideas including some novel ways of presenting the food itself. We dined at Sarkies Corner again recently – definitely the best place we’ve found to eat in Penang – and were impressed by the presentation of the food as well as by the variety and quality of the food itself. The E&O had lots more lovely things on offer in spoons and shot glasses, but these two photos should be enough to give you the idea. I guess most of us wouldn’t think to present a salad in a shot glass. It’s a very dainty and attractive presentation. I like it, and decided to create some of my own ideas on a similar theme. 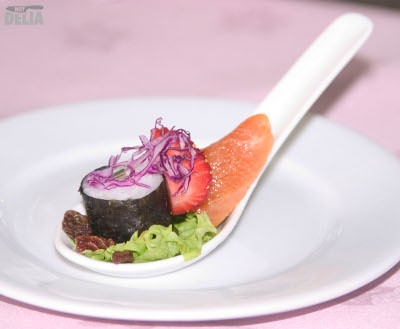 Chinese-style spoons also lend themselves to this kind of presentation. Of course, you wouldn’t give anyone such a small portion by itself as a starter but you could get creative and perhaps serve three such tinies together on one larger plate. Or you could perhaps serve one as an amuse bouche or several of them as part of a larger buffet. I seem to have got in a bit of a muddle with my photos, but at least I managed to find my attempt at a prawn cocktail presented in a shot glass. I also did my white chocolate pots in shot glasses too. Perhaps you’ll feel more inspired by the pics taken at the Eastern & Oriental buffet. Whatever, I’m sure you’ll agree that shot glasses are very handy for a simple, yet attractive way of presenting food. PS: Sorry I’ve not been updating Not Delia as often as I’d like to – I have a huge backlog of photos, reviews and recipes to publish. It’s just that I’m up to my neck in doing other things right now. Normal service will resume shortly.